After more than three weeks of winning, the streak is over. The Cleveland Indians saw their 22-game win streak broken Friday night by a 4-3 loss to the Kansas City Royals. The Indians fall a few games short of tying the MLB record of 26 straight wins set by the 1916 New York Giants. But the streak is nevertheless a massive accomplishment by the defending American League champions, one that has undoubtedly made them favorites to return to the World Series in 2017. The end of the streak did not come with sadness for the Indians or their fans. Following the game, home fans in Cleveland rose to their feat and offered the Indians a standing ovation in recognition of what they accomplished over the course of 22 games. The players and coaching staff returned the favor by offering their applause for the fans who came out to support them during the streak. All along, the Indians insisted they weren’t thinking about the streak, only playing good baseball day after day. Francona doesn’t think that’s going to change. Aside from having less national media covering them, the skipper thinks the Indians will continue playing at a high level moving forward. What’s amazing about Cleveland’s streak is they did it without so many key players. Andrew Miller only returned from the DL on Thursday at the tail end of the streak. The Indians also lost center fielder Bradley Zimmer to a broken hand during the streak. The entire streak also took place with left fielder Michael Brantley and second baseman Jason Kipnis on the DL. The Indians are expecting Kipnis back soon, although there is no firm timeline on Brantley. The streak has put the Indians on the verge of winning their second straight AL Central title. 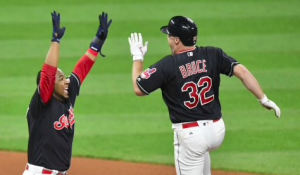 Cleveland’s magic number is down to 2, meaning they can clinch as early as Saturday. Twenty-two straight wins has also helped the Indians usurp the Houston Astros for the best record in the American League. If the Indians can remain ahead of the Astros over the next two weeks, they will have home field advantage throughout the playoffs. Aside from putting themselves in a better position during the postseason, the streak has also made a statement about Cleveland’s potential in the playoffs. Winning 22 straight games has reminded the league just how good the Indians can be. The Tribe were one game shy of a World Series title last year, and they remain a serious threat to win a world championship this year.